The Chamber Music Ensembles offer instrumentalists the opportunity to apply theoretical knowledge to practical music making in an intimate and informal master class setting. Taught by Judith Eissenberg, MUS 116—Chamber Music: from Page to Stage, offers musicians the opportunity to apply theoretical knowledge to practical music making in an intimate and informal master class setting. Interpretation emerges as each piece’s unique structure is uncovered, and historical context, technique and style are explored and discussed. Individual practice and ensemble rehearsal in preparation for coaching sessions are required. Course work includes written assignments, listening and selected reading all aimed at getting "inside the piece." Class assignments include "You are the Critic," an opportunity to listen critically to multiple renditions of a work, and apply acquired skills and knowledge to choose the most convincing performance. Each ensemble gives informal "talk-n-play" demos of the piece being prepared for the final performance. Other coaches include members of the Lydian String Quartet and pianist Evan Hirsch. Performance opportunities include the Wednesday Noon Concert Series at the Mandel Center for the Humanities, and the final recital in the Slosberg Music Center. This course may include graduates and undergraduates and may be taken for credit, or xc-credit. 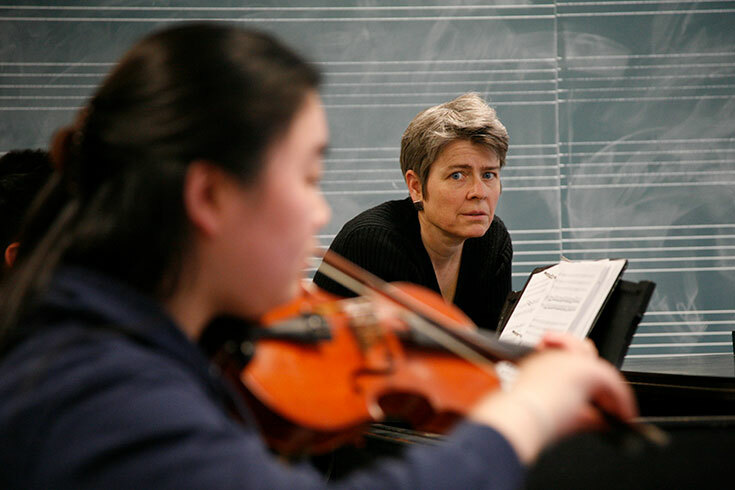 Taught by Judith Eissenberg, MUS 116—Chamber Music: from Page to Stage, offers instrumentalists the opportunity to apply theoretical knowledge to practical music making in an intimate and informal master class setting. Interpretation emerges as each piece's unique structure is uncovered, and historical context, technique, and style are explored and discussed. Individual practice and ensemble rehearsal in preparation for coaching sessions are required. Course work includes written assignments, listening, and selected reading all aimed at getting "inside the piece. Other coaches include members of the Lydian String Quartet, and pianist Evan Hirsch. Performance opportunities include the Wednesday Noon Concert Series at the Mandel Center for the Humanities, and the final recital in Slosberg Recital Hall. This course may include graduates and undergraduates and may be taken for credit, or xc-credit. Listening, syllabus, class expectations, readings, journal entry assignments, etc. on line. Whatever official capacity you are registered as (credit, x-credit, audit), my expectations of your involvement are the same. My philosophy as a teacher and as a musician is really about deepening and broadening your experience of chamber music, as a listener and player. So I would like to tell you why I have set the class up as it is, and what I hope you'll get from it. All of you can play an instrument. Most of you have played some form of chamber music before. I assume that you like to listen to and play music, and that you get pleasure from learning a piece and making it sound well. I want to continue with that, and add some depth to your experience by exploring the internal (formal) and external (contextual) aspects of music you will be listening to and performing. Most of all, I want you to experience and perform the drama - the 'story' inside each piece, learn how to draw it out, highlight it for ourselves and the audience. Most of the music you'll play will be from the 1700's through the mid 1900's (although I always love having newer music in the class). One of the big challenges of playing the older music is how to bring to life the dissonances, the excitement, and the surprises in it that thrilled audiences at the time. In one sense, it all can sound so consonant and 'pretty' that we (and today's audiences) don't really experience some of the best parts: the broken rules, the 'con-jobs', the jokes, and more, that the great composers put in their music. One of your challenges as interpreters is to make the older, traditional classical music contemporary, to hear it as it was when it was first written, and to present it to your audience in the spirit of that original excitement. The master class setting offers you the opportunity to hear a variety of music, learn from others being coached, get experience playing in front of others in an informal, supportive setting. There will be different levels of experience in the class, but we are all here to make and appreciate music. We will often divide up into clusters...one or two to a coach in different rooms, so you get more coaching time. And you will have the opportunity to get private coaching for your group during the semester. You are required to set up three private coachings outside of class during the semester with a coach of your choice (check with me for details). Please inform me when you have these, as I will make a record of them. The Lydian String Quartet will be coming to class to perform. The Lyds will play, talk, demonstrate, and discuss the works they bring. The objective of these class appearances is to have a close look at such things as structure and style, to discuss choices that are made when putting together a piece, to learn a bit about rehearsal technique, etc. Often the quartet will be preparing the work for concert, and you will have the opportunity to see the work-in-progress. These assignments are for you to reflect and put into words what you discover, feel, learn about the music. I hope you deepen your appreciation of music through thinking about the assignment, and become a better musician. I hope you develop your opinions and are more able to express yourself in performance by what you learn. You must write acceptable journal entries ON TIME to pass the course. By acceptable, I mean that your entry reflects you have done the reading and listening, and you have thought about your response. These need not be formal, but they should be clearly written, and certainly at a university level in terms of basic writing. These will be sent to me via the online course, and I will read and comment, and in some cases, ask you to revise before I post them online for the class to read. There are two performance opportunities for this class: an hour-long recital on the Noon Concert Series (Wednesday at the library), and the final concert at the end of the semester. Check your syllabus for the dates. You must play on at least one of these to pass the course. You must play in the final concert unless there is some extraordinary excuse that is acceptable! Performance is an essential part of this class, educationally and philosophically, as I hope you will agree. It is also an honor, and one I believe each one of you deserves. Class attendance is mandatory. Each group is required to meet at least once a week for at least an hour on your own to rehearse. We meet together only once a week, and your group depends on your being in class and at every rehearsal. I hold each of you responsible for your group's performance. I expect you to be individually prepared to play your part. Your private teacher can help you with instrumental issues, and I don't mind a bit of that in class, but you must have your notes learned as soon as possible. Despite the above sternness (!!!) I like an informal, fun atmosphere, where we all learn from each other. Just as in your own rehearsals where it is healthiest for everyone to have a part in the shaping of his/her piece; it is good for the class for everyone to participate. Check your syllabus. I have sketched out the general outline of the semester. Go to concerts! Email me, talk with me, keep in touch. Chamber music is my professional life...playing it, teaching about it, learning about it...I look forward to sharing it with you. Students with Disabilities: If you are a student with a documented disability on record at Brandeis University and wish to have a reasonable accommodation made for you in this class, please see the professor immediately. Instructor: Professor Judith Eissenberg eissenbe@brandeis.edu Office hours: Monday 1-3, by appt. appreciation of chamber music from the European classical tradition. Sept. 2 Introduction, go over Class Expectations, Syllabus, Assignments. Review: form, motive. Students with Disabilities: If you are a student with a documented disability on record at Brandeis University and wish to have a reasonable accommodation made for you in this class, please see the professor immediately. Retroactive accommodations cannot be provided. Ultimately, our decisions of how to highlight, shape, and translate these ideas become the art and responsibility of a performing musician. The decisions we make in our performance affect the audience's relationship to the piece. For this assignment, you will compare two recorded performances of the movement you have been studying. So far, you have listened to the Alban Berg String Quartet's interpretation of the piece. Now you will listen to the Cleveland and the Vegh interpretations. Here are the timings. Note that the Berg and the Cleveland take the exposition repeat while the Vegh does not. What will you be listening for? There are two categories of interest for comparison. One is comparing the groups' basic approach to sound and to ensemble playing – their ensemble style. The other category is how each group interprets the piece. How does each project the composer's ideas and values, how does each bring out the drama of the piece? You can't help but be influenced by the initial listening you have been doing; so I don't want you to write about the Berg. Rather, I want you to try to listen with fresh ears to the other two. On first listening to each group, jot down some notes about your general impressions of each group. Write: How would you describe the sound? What would you say are the ensemble values (contrast, clarity, smoothness, etc.) Are the players evenly matched? Other things strike you? Before you listen for the second category (interpretation), answer these questions. Write: We know the introduction provides the source material for the movement, but what is the dramatic role of this introduction? What mood do you think it should set? How does the allegro 'answer' the adagio? Where are the moments of stability in the exposition, what are moments of dissonance (by dissonance, I mean instability…it can be caused by harmonic, melodic, rhythmic, dynamic, etc. tension)? Where are the moments of greatest tension in the development? How does Beethoven prepare and effect them? What are the differences in the recap (from the exposition)? What are the effects on the music? What is the role of the coda? Write: Now, with these things in mind, compare the two performances, writing about how each group approaches what you have discovered makes this piece tick. Musicians use all sorts of 'tricks' to project ideas: volume, sound color, tempo, balance, timing, rubato, etc. It is, of course a subjective thing, but try to articulate how each group succeeds or fails (or something in between) in bringing out what makes the piece unique. What are the tricks they use? What have they missed? Are there things you wish they had done, that you would do if you had the chance? Keep in mind the compositional values (motivic use, dramatic shape, etc.) that you have explored. Which is the more successful performance, and why? In this class, you will spend much of your energy preparing the pieces you will be playing in class and performing. While learning the notes and becoming more at ease with the art and craft of being a musician (in particular, a chamber music player) are the main goals of the class, we will also explore the more philosophical, personal, and cultural aspects of music. In a previous class we looked at how instrumental music (and here I am mainly referring to classical music of the Western European flavor!) underwent a transformation in the mid 18th century - composers began to write music that did not need a secondary focus of theater, dance, or words. Audiences came to concerts searching and expecting to find meaning in the new abstract music. We questioned what sorts of ideas are communicated through this music: Emotional? Spiritual? Literal? We explored commonalities between composers, as well as what makes each composer unique among other composers. We looked at the important of context (time, place, culture, particular events) and its relationship to what is expressed by the composer in his/her music. This semester's theme is "Engaging the Imagination". When you think about it, it seems extraordinary that the sounds that we hear can express ideas…that through this thing called music, someone we may never meet can create a soundscape that we can relate to, feel we understand, and in some cases, feel deeply about...or not…a lot depends on how you listen to what you hear. As Nicholas Cook reminds us in a reading you will do, "Classical music is no longer itself when it is used as background music. It becomes like 'easy-listening' popular music, valued more for its geniality than for its genius. But the change that comes over is a change in the listening, not in the notes. The performance that a student puts on the cassette player while studying may be a performance that thrilled Philharmonic subscribers." A Mozart quartet whispering like aural wallpaper in the background while studying, the great Schubert cello quintet shadowing the animated conversation in a fine restaurant, a Chopin sonata echoing in the mall…it is not that these are blasphemous offenses, it is that they are such lost opportunities! So our third goal this semester (along with learning the notes and playing together) is to become more engaged with the music we are hearing and playing, and to successfully engage our audiences as well. To do this, we will try to understand the music itself - as a collection of ideas that someone expresses through sound. Our tools for understanding are our ability to analyze what we are actively listening to, and our imagination, which translates what we hear into ideas and meaning we can relate to. As we engage, we do a little reconstructing, creating, and recreating of the music. Ultimately, our decisions of how to highlight, shape, and translate these ideas become the art and responsibility of being a performing musician. The decisions we make in our performance affect the audience's relationship to the piece. How do we get them to listen to the sounds they hear, how do we get them to engage, to use their imaginations so that they begin to construct some internal meaning and go into that very personal and temporal world that music offers? The music we will be looking at and playing is 'idea' music; each piece has ideas in it that we will uncover and explore. In my own chamber music work I have found that while I might be drawn to particular aspects of the music (architecture, the ebb and flow of dissonance, the use of motives), the other musicians working on the piece with me are drawn to different aspects (melody, rhythmic flow, harmonic articulations). We can use each other's strengths and interests to get more fully 'inside the piece' as we uncover the mechanics that add up to ideas. The wonder of music lies in the way these can, through our imagination, inspire emotional and spiritual resonance. Hopefully, we will get closer to the composer's ideas and to each piece as a unique work of art with its own internal drama, and by doing that, discover our intersections as human beings in relationship to each other. Goal: Give a convincing lecture-demo on a work (movement/song) from the chamber music repertoire. You may include historical information, but the bulk of the presentation must be about formal issues (structure, thematic, motivic, key, etc.) The end result is to strengthen your performance by understanding the larger form, and the 'building blocks' that the composer uses. What is the basic form? What is standard about the piece? What is unusual or unique about this piece? Anything interesting about phrase structures? What are some of the interesting compositional techniques employed? You may make a group presentation, dividing up the work, or work as individuals. You must talk AND play. I have enough scores in the score notebooks for all the pieces you are playing. Give me a typed proposal of what your main points are, and who will be responsible for what parts of the presentation. I must okay this before you go ahead. Hand in a typed outline with details of your presentation (points, sub-points, bar numbers for examples) OR a 2-3 page typed paper of your main points with support examples. If one person does this, any of the others should be well-versed in the points. Give a fluid convincing oral (speaking/playing examples) presentation from 10 to 15 minutes.